November 28, 1908 -- Herriman commemorates lightweight boxer Freddie Welsh's victory over Abe Attell with a cartoon celebrating his prime attributes. 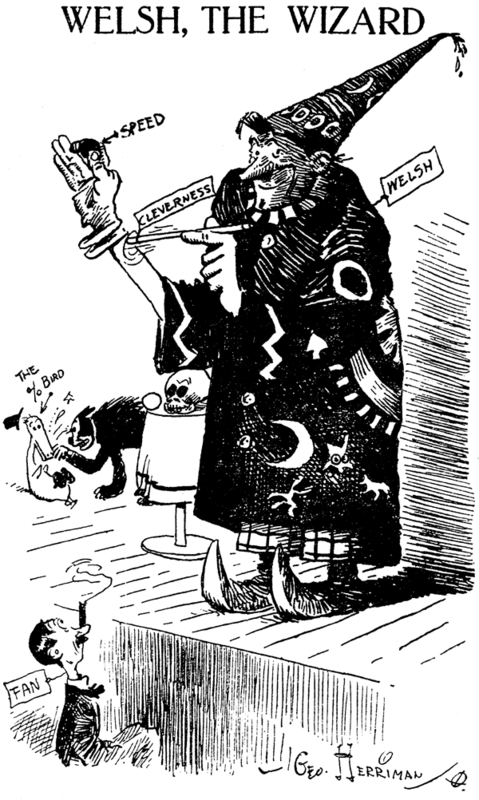 Note the rather 'katty' cat beating up on Gooseberry Sprig in the background, and the vaguely Native American symbols on the cloak, later a standard feature of Herriman cartoons. 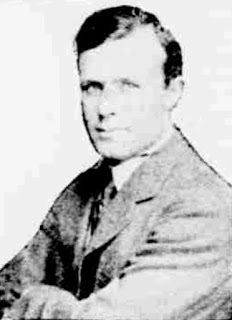 Evan Burton Johnson was born in Pittsburgh, Pennsylvania, on January 21, 1881, according to his World War I and II draft cards. Johnson’s parents were Peter and Nellie. The Philadelphia Inquirer (Pennsylvania), March 4, 1900, published a piece of verse, “My Wooing”, by E. Burton Johnson. In the 1900 U.S. Federal Census, Johnson was the second of three children. He was a news reporter and his father was a glass blower. The family resided in Bridgeton, New Jersey. At some point, Johnson moved to Chicago. The 1904 St. Louis, Missouri, city directory listed artist Johnson at 1221 North Grand Avenue. 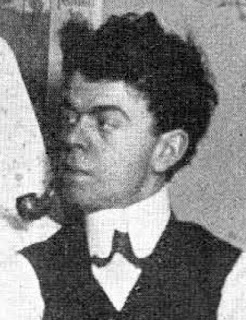 In the 1906 Denver, Colorado, city directory, Johnson resided at 1453 California and was an artist at the Times. 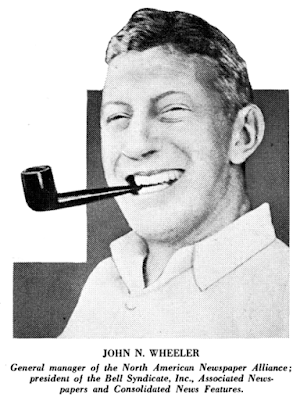 Johnson also contributed sports cartoons to the Denver Rocky Mountain News. Johnson’s editorial cartoons appeared in newspapers such as the Salt Lake Tribune (Salt Lake City, Utah), December 8, 1907. At some point Johnson returned to the East Coast. According to American Newspaper Comics (2012), Johnson produced Scientific Sam—Have You Met Him? for Press Publishing. The strip ran from August 16 to October 6, 1909. 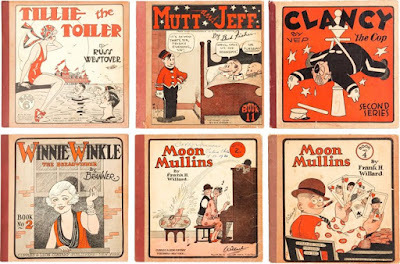 The 1910 Trenton, New Jersey, city directory said the cartoonist resided at the Lovell. Johnson was the subject of a national news story when he was released early from prison. The Sacramento Union (California), March 27, 1914, reported Johnson’s plight. In May, 1913. Evan Burton Johnson, newspaper cartoonist and writer running wild on a “bat,” got off a Southern Pacific train at Stockton to get a drink. He was en route from Los Angeles to San Francisco. His fare had been paid and he had a few dollars in his pocket. On May 26, 1913, Johnson pleaded guilty to cashing a worthless check on a saloonkeeper in Stockton and was sentenced to serve four years at hard labor in Folsom prison. 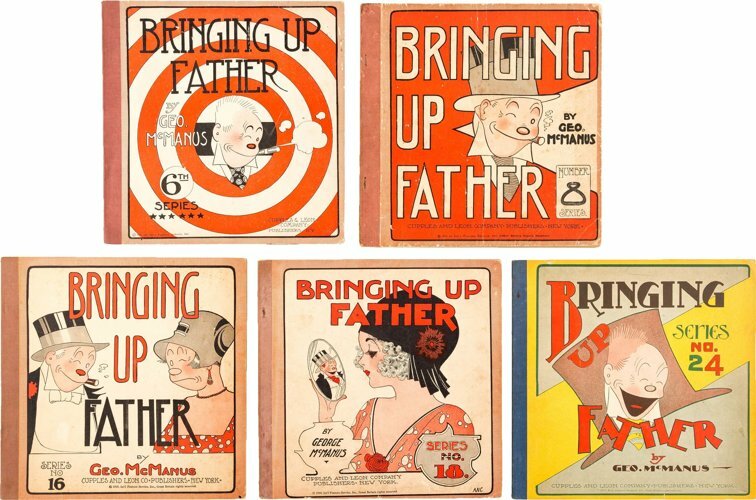 On June 3, 1913, the cartoonist began a fight to establish his innocence and regain his liberty after prison doors had clanged behind him. On March 28, 1914, tomorrow morning, Johnson will be released from Folsom prison, his sentence having been commuted by Governor Hiram Johnson. Such is the chronology of the “black letter” days in one year of the life of a talented cartoonist and writer, well known on both sides of the continent. Johnson tells it himself impersonally. He tells how the booze “got him” and then tells of his hopes for the future. Will Be Free Man Tomorrow. Johnson will leave Folsom prison tomorrow morning credited with the feat of literally cartooning himself out of the penitentiary and three years of prison life. 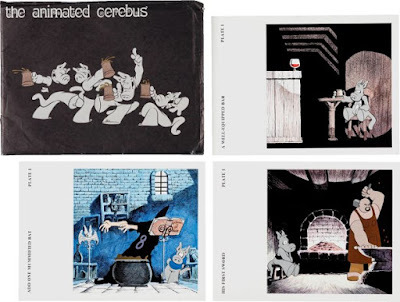 During his incarceration of less than one year he has drawn at least 200 cartoons trenchantly portraying his views of penal servitude. 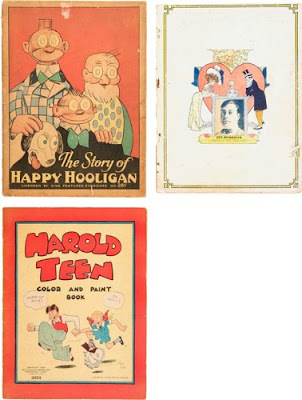 His pictorial glimpses of prison life were handled with humor and satire and philosophy. None of his sketches were published, but some of the most powerful found their way to Governor Johnson’s office. During a visit to Folson [sic] prison last winter the governor interviewed the cartoonist and was interested enough to order an investigation of his case. 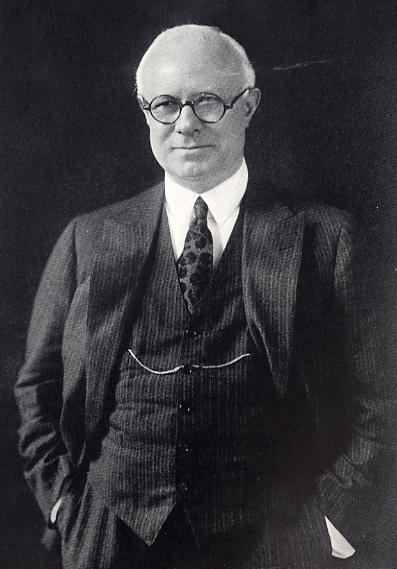 It was done by Martin Madsen, executive secretary of the governor and a newspaperman himself. Madsen’s investigation disclosed that the avarice of a saloonkeeper and Johnson’s drunken irresponsibility were the primary causes for the worthless check in Stockton. A commutation of sentence to one year, which with credits deducted expires today, was the result of Madsen’s report. World Anxious to Help Him. Johnson comes again into the world of men with a chance. He has a berth assured with a big advertising agency in Portland, Ore., and a New York theatrical promoter has offered to produce a three-act drama completed while the writer was in prison. Johnson was busy while he he was behind the grim walls at Folsom. 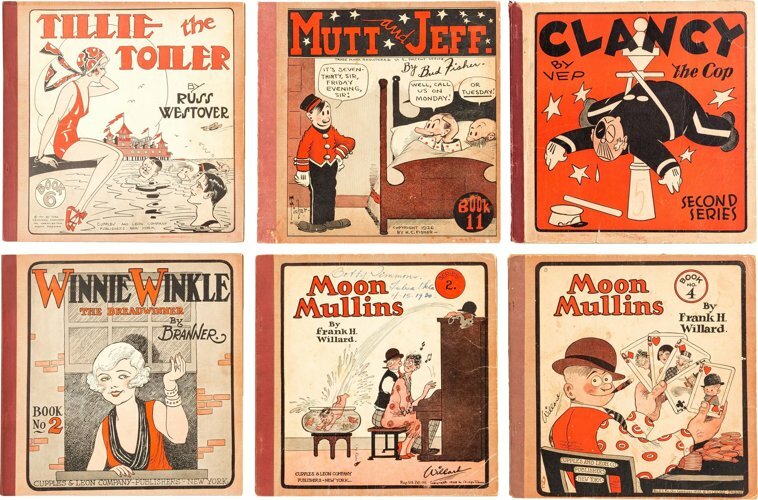 Several vaudeville playlets were written to supplement “The Millionaire Burglar,” an act conceived by Johnson five years ago and produced in London by Currie Stewart and later in New York. The story of the crime for which Johnson was convicted is a sordid tale of booze and greed. Johnson was beastly drunk on the train and in bis drunken irrelevancy concluded liquor on the “valley flyer” could be improved on at Stockton. Following out this line of logic he quit the train. Two hours later, broke and boisterous, he was induced to sign a check written by a saloonkeeper, the latter volunteering to fill in the check because Johnson’s scrawl was illegible. Of course the check was not good. It was a check on a Stockton bank—the hank patronized by the saloonkeeper. Johnson was given a chance to make the money good, but he could not. He pleaded guilty and took his medicine and then he found out just how it all had happened and began his fight. Without money and without friends be figured the quickest way to recognition was to do the things he could do well —that is, cartoon. How well he builded was exhibited by the interest shown in the executive office and his promised release tomorrow. 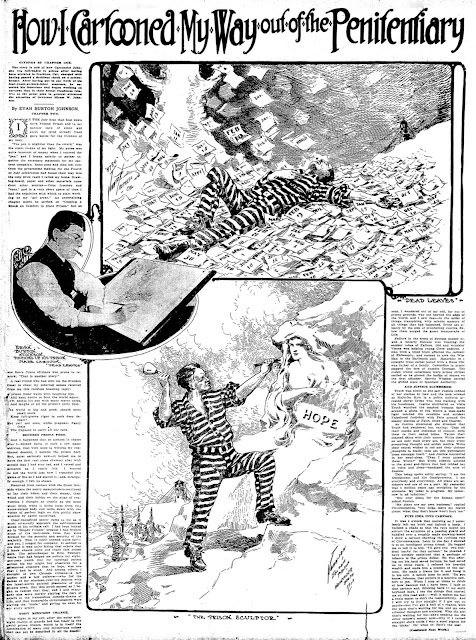 The San Francisco Chronicle published Johnson’s illustrated story, “How I Cartooned Myself Out of the Penitentiary”, in five weekly installments from May 10 to June 7, 1914. On September 12, 1918, Johnson signed his World War I draft card. He and his wife, Edith, lived at 622 West 141 Street, in Manhattan, New York City. Johnson was an artist and advertising writer at Continental Illustrating Company, 2 Rector Street, New York City. His description was tall, medium build with blue eyes and gray hair. The 1920 census recorded Johnson and his wife in Brooklyn on Bedford Street. He was the proprietor of an advertising company. The Bronx was advertising writer Johnson’s home, at 1800 Popham Avenue, in the 1925 New York state census. 1927 Mount Vernon, New York, city directory listed Johnson at 284 South Columbus Avenue. Johnson was a manager in an advertising company as recorded in the 1930 census. He and his wife were at 52 Sherwood Place in Greenburgh, New York. In the 1940 census, Johnson lived in Brooklyn at 61 Poplar Street. The census indicated the advertising writer was married but it was crossed out. The status of his wife in not known. Johnson’s address was the same on his World War II draft card which said his freelance advertising company was at his home. 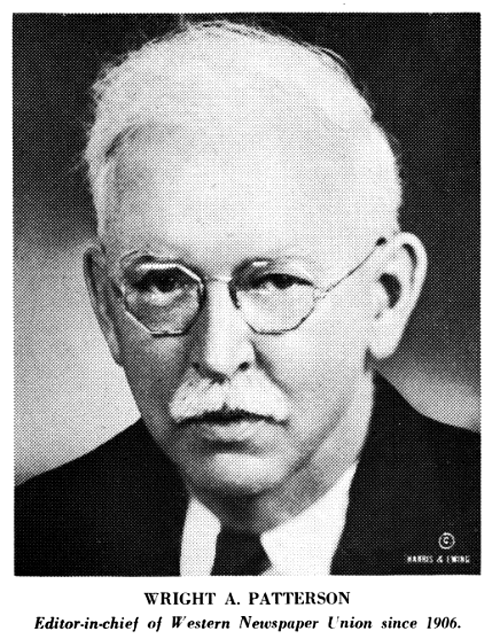 Johnson named Mrs. Earl Heins of Philadelphia as the person who would always know his address. The date of Johnson’s passing is not known. The Social Security Applications and Claims Index said a life claim was made February 2, 1955. Johnson’s name has not been found at the Social Security Death Index. 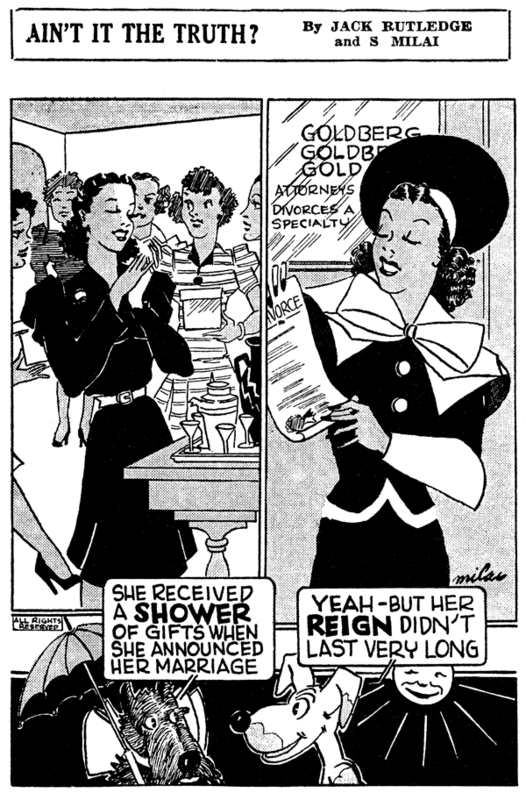 Obscurity of the Day: Ain't It The Truth? 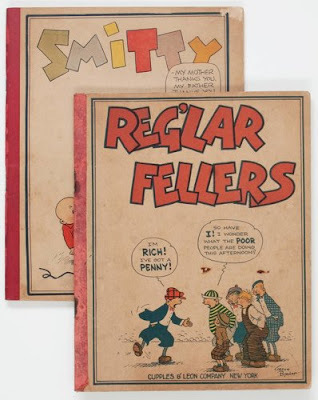 Sam Milai was one of the anchor cartoonists at the black-owned and operated Pittsburgh Courier from the 1930s to 60s. 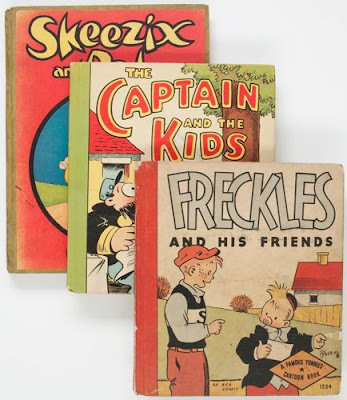 In addition to his long-running series Bucky, Sunnyboy Sam and Your History, he did a few short-lived ones, like Ain't It The Truth? 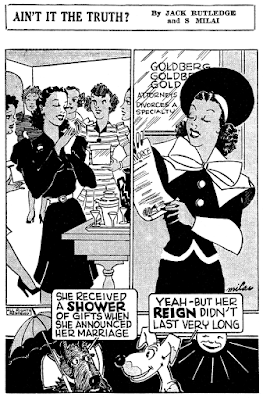 This panel, which ran in the weekly Courier from December 17 1938 to June 10 1939, was apparently written for Milai by a fellow named Jack Rutledge. 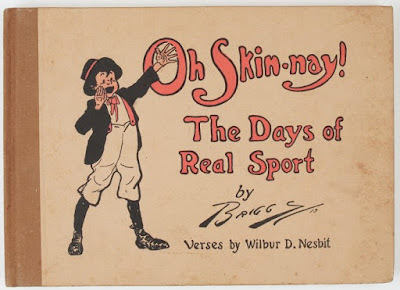 I know nothing about him, but he did seem to have a slightly more sophisticated ability to write cartoon comedy than Milai, as displayed in the sample above. That left Milai to do what he did best -- draw delightful cartoons. Herbert Hollingsworth Johnson was born in Sutton, Nebraska, on October 30, 1878, according to his World War II draft card. His full name was found on a family tree at Ancestry.com. In he 1880 U.S. Federal Census, Johnson was the youngest of two sons born to Joseph, a broker, and Mary. The family resided in Sutton which was their home in the 1885 Nebraska state census. In the state census, Johnson was the second of four brothers. At some point, the Johnson family moved to Lincoln, Nebraska. In the Evening Public Ledger (Pennsylvania), February 4, 1919, Johnson said he and Clare Briggs both studied at the Western Normal College in Lincoln, Nebraska. At the time, Johnson was fourteen and Briggs, seventeen. 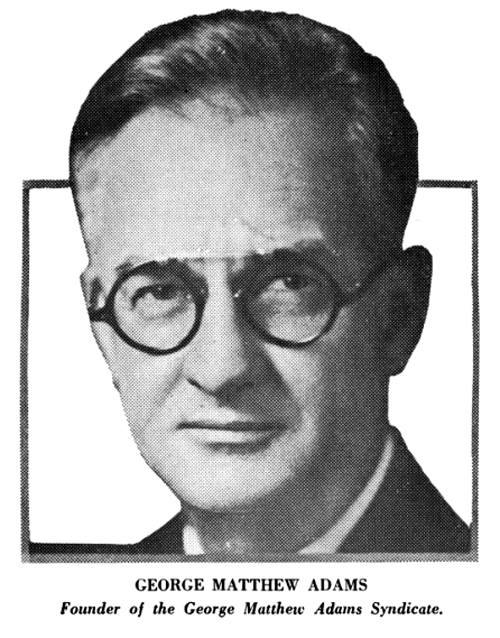 The Omaha World-Herald, (Nebraska), October 18, 1936, said Johnson attended the University of Nebraska. 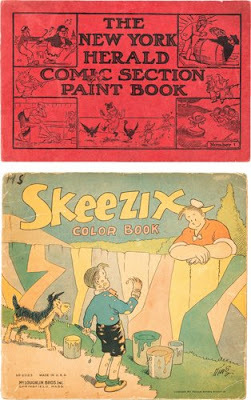 At the university he became cartoonist for all school publications. 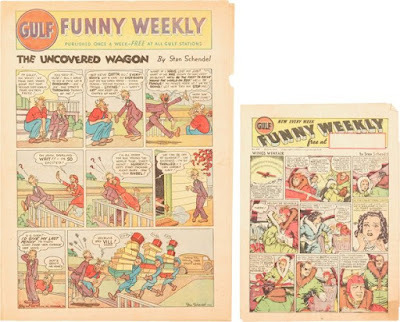 Professors at the university recall how Johnson attended a history examination, turned in a paper with several historical cartoons drawn on blank sheets of paper, received a perfect grade for his effort. The University Missourian, (Columbia, Missouri), May 20, 1914, published Johnson’s account of how he became a cartoonist. Previously, he had been a clerk and stenographer. Johnson’s early career was recounted in the San Diego Union (California), August 8, 1926. …Johnson’s first experience in cartooning began with the Denver Republican, and his first “sit” lasted two months. Then he trekked to Chi[ago] looking for a job and later went to Kansas City, where he hooked up with the Journal of that city. 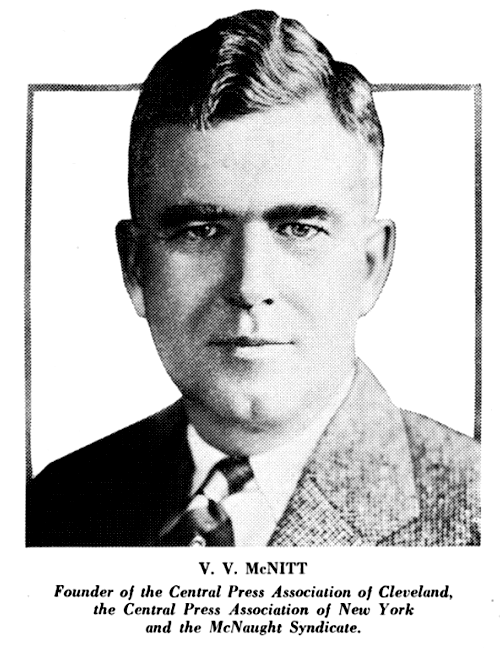 Later he returned to Lincoln, Neb., and entered the state university, taking his degree. Then he drifted out to California…. “In California I walked over the greater part of the state, working at all sorts of day labor jobs. I worked as a snow shoveler in the Yosemite valley, shoveled dirt, did teaming, wrangled horse, and one time rode 75 miles in one day and 50 the next, driving 21 herd of horses. I rambled through most of the state. “In July I moved on to Lake Tahoe, stayed a short time and then wandered on looking for work. Finally I landed as circulation man on the Arizona Daily Citizen at Tucson. This didn’t last long…as the paper changed hands and I had an opportunity to go back to the Kansas City Journal that fall I decided to move again. I remained there a year as the head of the art and engraving department. 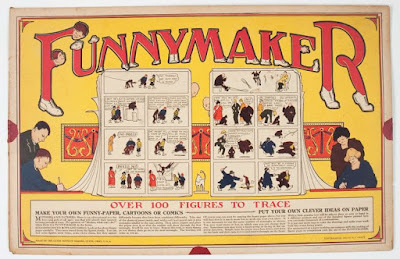 American Newspaper Comics (2012) said Johnson produced the Sunday strip, Eph Jackson, for the North American from December 3, 1905 to February 11, 1906. Johnson was counted twice in the 1900 census. The cartoonist was named in his parents’ household in Lincoln, Nebraska, at 1705 M Street. Johnson resided in Kansas, Missouri, at 920 Locust Street. 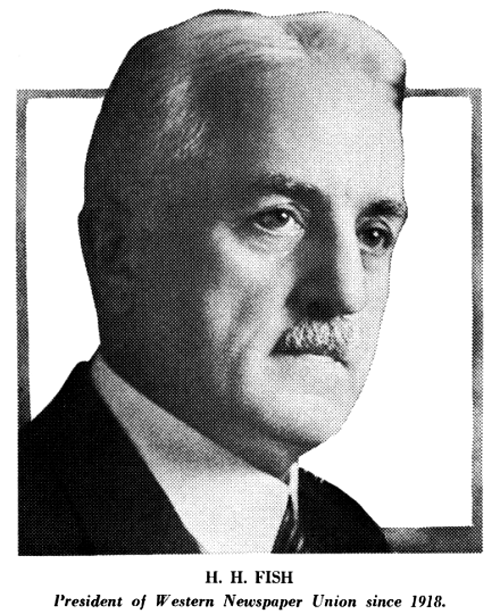 In the 1910 census, Johnson was a resident of Philadelphia and lived at 6333 Drexel Road. He married Helen two years ago and had an eight-month-old daughter. His mother-in-law was part of the household. Johnson’s address was unchanged in the 1920 census. 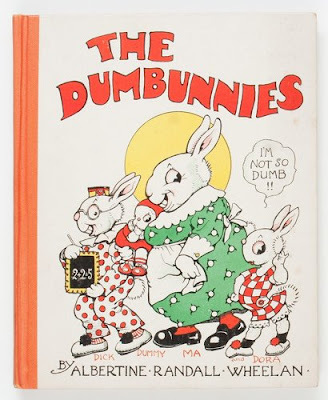 The cartoonist had two daughters, Herberta and Katherine. In the 1930 and 1940 censuses, Johnson and family were residents of Huntingdon Valley, Pennsylvania, at 232 Second Street Pike. 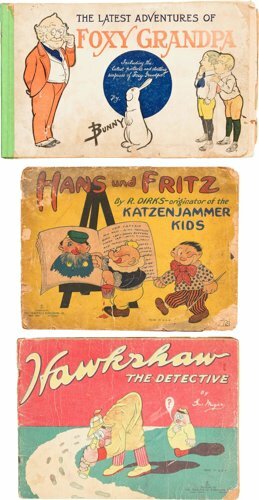 Johnson continued cartooning at the Saturday Evening Post. On April 27, 1942, Johnson signed his World War II draft card. He and his wife resided on Morningside Farm in Huntingdon Valley. The card did not name an employer; Johnson was probably retired. According to the family tree, Johnson passed away December 6, 1946 in Abington, Pennsylvania. 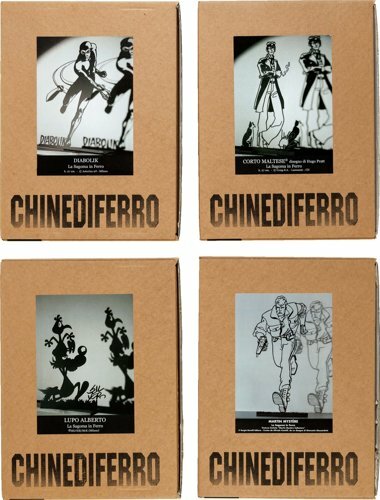 A set of 4 highly detailed 2-D metal sculptures of famous Italian comics characters in original boxes. This was a gift to me from Martin Mystere writer and comics scholar Alfredo Castelli of Italy. A group of four harder to find Platinum books -- Dolly Dimples and Bobby Bounce by Grace Drayton, Tailspin Tommy, Smitty in very rare dustjacket (not pictured), and a rare original content Cupples & Leon, Tom & Jerry the Jolly Plumbers drawn in a delightful animated cartoon style. A group of six harder to find Platinum books, these ones mostly in the fragile oversized category -- Hawkshaw the Detective, Hans und Fritz, Latest Adventures of Foxy Grandpa, Harold Teen Color & Paint Book, The Story of Happy Hooligan, and a coverless copy of the rare and valuable 1907 Newlyweds and their Baby. I have asked Heritage to withdraw this lot and reconsider the EXTREME rarity of some of the items. But in case they don't, this is a major collector alert. 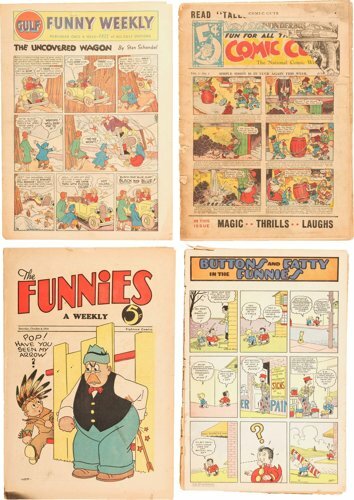 Along with the three Gulf Funny Weekly sections and the very rare Buttons & Fatty in the Funnies (fragile format and had very limited distribution) are two VERY IMPORTANT early original content comic books. 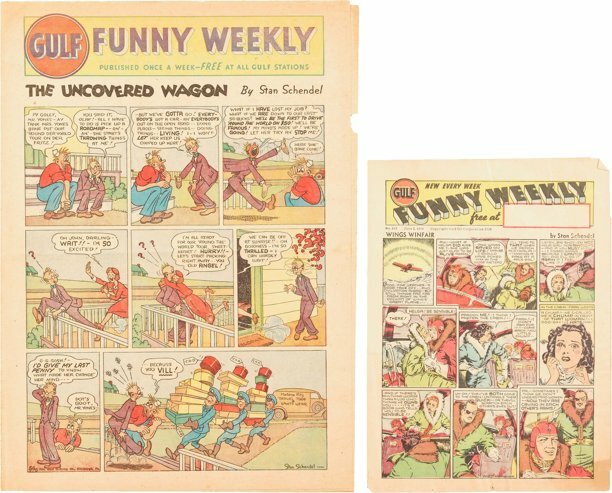 We've talked about the rarity, mystery and importance of The Funnies on this blog at length, and this is the only copy I have ever been able to lay my hands on despite a quarter century of looking. 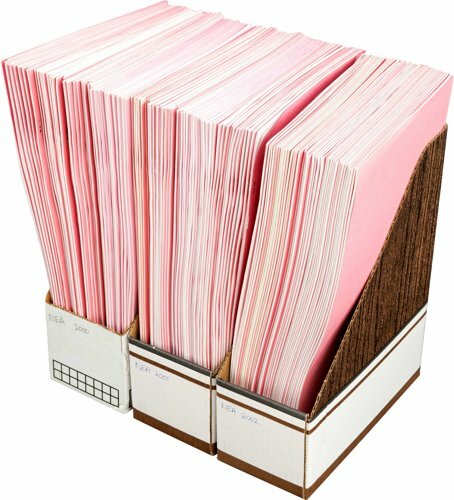 PLUS, included with it comes a large batch of color and black and white photocopies of issues contributed to me for research purposes by other collectors. 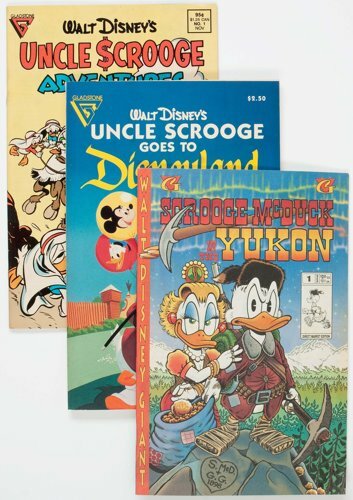 Second is a copy of Comic Cuts, also so rare it's the only one I've been able to find. It is said to be the direct predecessor of the DC comics line in that Major Wheeler-Nicholson was inspired by this short-lived series to start his foray into comics publishing. What can I say except FIND ANOTHER COPY -- GOOD LUCK! 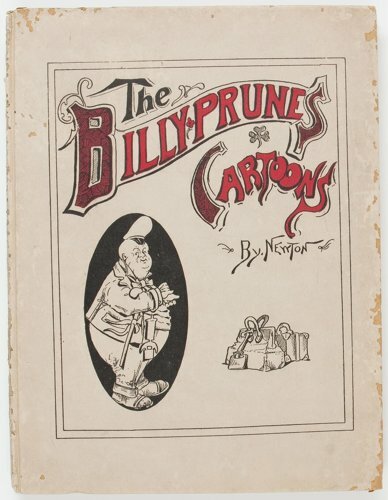 Very early Platinum hardcover comic, and not listed in Overstreet, The Billy Prunes Cartoons reprints a series of rollicking traveling salesman comics that appeared in the Minneapolis Journal in 1903-1904. Really fun stuff, and of course exceedingly rare. The Animated Cerebus Portfolio is a collection of 45 color plates by Dave Sim; a delight for aardvark fans. 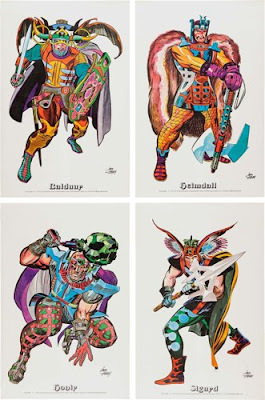 Jack Kirby's 1972 Gods portfolio, in original sleeve, from back when no one had ever heard of a cartoon art portfolio. A really neat activity set that allows kids to create their own customized comic strips based on a bunch of pre-drawn characters. A cool idea, but it sure didn't catch on, because I've never seen another. 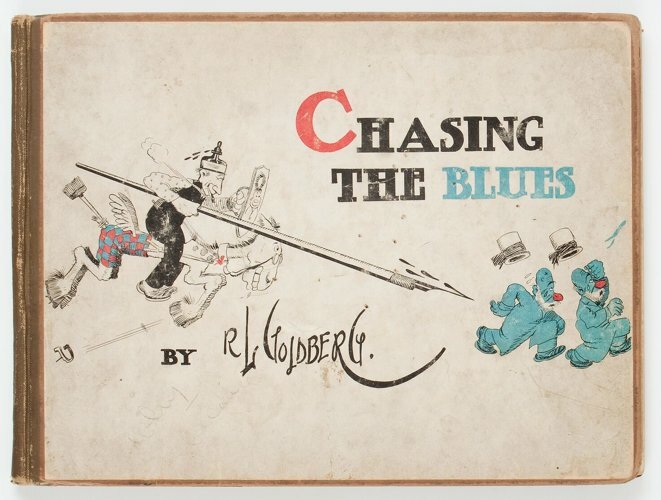 The art is unsigned but really attractive; reminds me a bit of McCay though it isn't him. 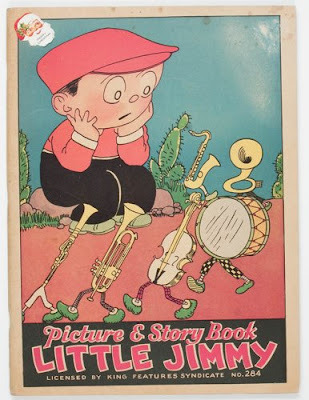 Little Jimmy Picture & Story Book, another hard to find Platimun item by Jimmy Swinnerton; really nice condition, and not colored in. 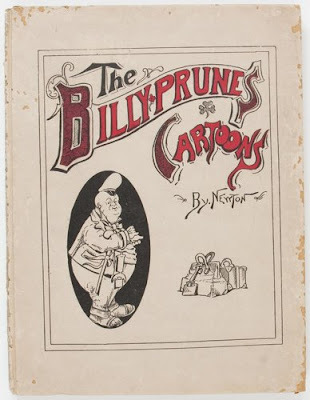 The great Clare Briggs in a very early book appearance -- 1913. This very large book is scarce but not ridiculously so; however, it is usually found in extremely beaten up and ragged condition. Other than a little bit of handling soiling, this copy is in stunning beautiful shape. Not only is The Dumbunnies by Albertine Randall Wheelan a very hard to find Platinum book, this copy is incredible -- almost like it just came off the shelf at the bookstore. 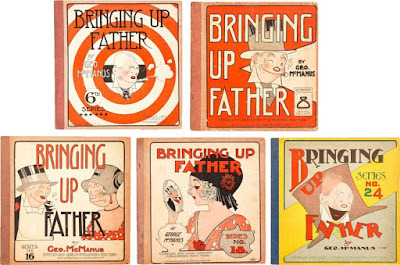 A collection of 5 Cupples and Leon Bringing Up Father books, including a very sharp copy of the hard to find #24. 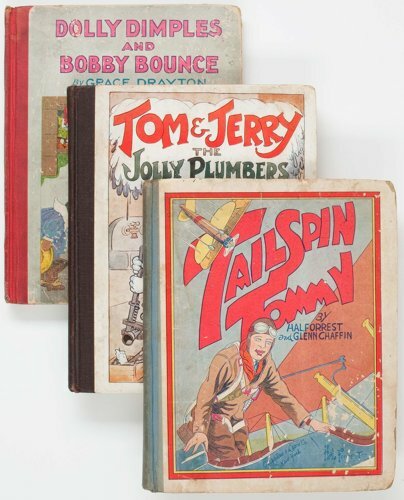 A collection of 6 Cupples & Leon Platinum books -- the big deal here is VEP's Clancy The Cop Second Series, which is both in beautiful condition and very scarce. 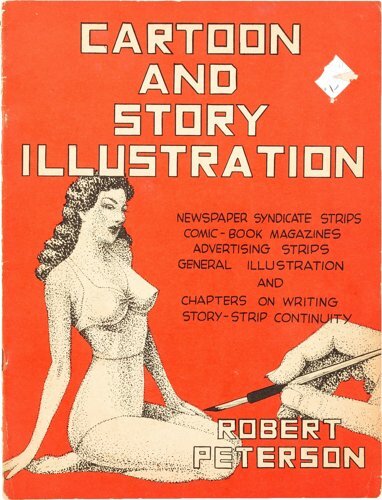 A group of 5 cartoon instruction related items, including Cartoon & Story Illustration by Robert Peterson, E.C. 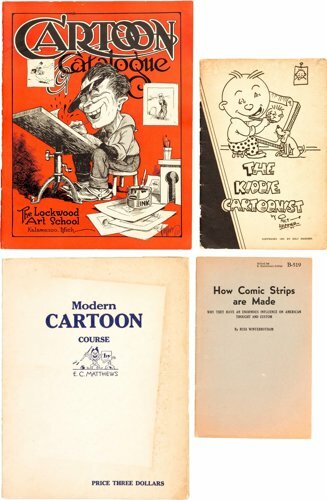 Matthews Modern Cartoon Course, Lockwood Art School Art Catalogue with a great Nate Collier cover, The Kiddie Cartoonist by Milt Hammer (which actually should qualify as a comic reprint book) and the public service bulletin How Comic Strips Are Made by cartoonist Russ Winterbotham, which is very scarce. Heritage has characterized this lot as a bunch of coloring books, which made me do a full Homer Simpson "D'oh" plus face slap. They are actually mostly comic strip reprint books that try to get extra marketing mileage by offering the rugrats a suggestion to color in the pictures after they're done reading. Heritage threw in a 1970s Popeye item (it's kinda neat -- daily comics printed at full original art size), but the rest are fine additions to any really good Platinum collection. I'm not going to describe them all, but I want to highlight a real full-caps RARITY that they threw in without any realization of what it is. I would not be going too far to say that The New York Herald Comic Section Paint Book, which is full of 1915 Herald strips (Mr. Tweedeedle by Gruelle, Snapshot Sam, Colonel Corn, Verbeek's Terrors of the Tiny Tads, etc), might actually be unique. I have never seen or even heard of another copy. 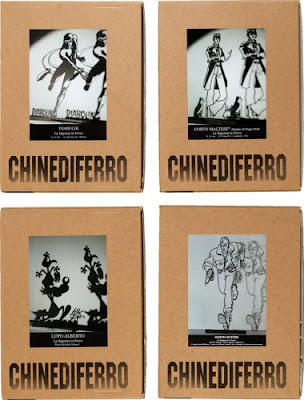 It is a small and very unassuming little book that you will likely never have another chance to own in this lifetime. Back before the internet made practically every rare book at least somewhat accessible, Rube Goldberg's Chasing The Blues was considered so rare that the folks who ran his estate once offered me a four figure sum for my copy, since they could not locate one for their archives. Well, I guess I should have taken them up on that offer. Today they pop up once in awhile. 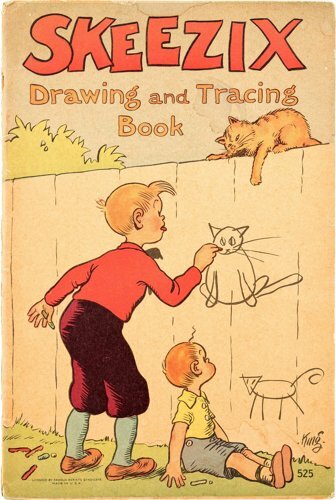 However, my copy does still have the singular quality that it was originally owned, and doodled in, by long-time King Features cartoonist J.P. Arnot!